One of the most famous dancing shows on Zee Kannada where the participants can show their world class skills in dancing is Dance Karnataka Dance. The participants can take part as a solo, duet, or group dancers. The show is highly appreciated in the first two seasons so here it is back with its 3rd season. They search for the best dancer and also flash some light over the hardship one faces on his road to become a dancer. The characteristic, coordination, and understanding between each dancer are shown very gracefully in the show. The highly talented Anushree will be seen as the host of the competition. There will be three judges in the show, crazy queen Rakshita, Chinnari Mutta Vijay Raghavendra, and the magical composer Arjun Janya. The passionate dancers can take part in the show by applying online for the show on the official website for the show. The dancers will be judged on the audition according to their quality by different guest judges like Diganth, Malashri, and Bhavana. 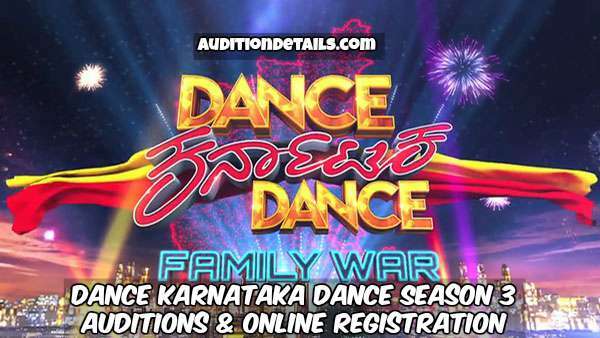 The people who will be selected from the audition will then take part in the amazing talent hunt show Dance Karnataka Dance Season 3 on Zee Kannada. Then the audience will see your talent and they will be voting for you. The winner of the show will get cash prize too along with the fame and title. There will be 14 teams in total in the show and in each team, there will 10 quality dancers and every single performance of a dancer will affect his whole team. So, everyone has to perform at his peak each time to stay alive in the competition. The venues where the auditions will take place will be Hubli, Mangalore, Bengaluru, and Mysore. This one of its kind group dance show is increasing in fame day by day due to its unique concept. As a viewer, if you had not watched it please as you have never seen a show before with such intensity. The auditions are going to start soon. The date has not been yet announced and we will update on our website as soon as the channel release the date. Stay tuned for more updates on Dance Karnataka Dance Season 3 and if you think that you have the potential to get the gold, reach for your dream.